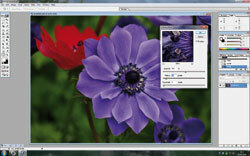 In part five, John Riley explores the first of two simple sharpening techniques in Photoshop. In previous articles we have organised our files and workspace, cropped and resized our image and adjusted its brightness and contrast. 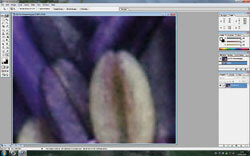 However, every digital image is slightly soft, so, as the very last stage, some sharpening needs to be applied. The Unsharp Mask dialog box. View at 700% no sharpening. Amount 100%, radius 20px, threshold 3. Amount 100%, radius 1.5px, threshold 30. The name for this basic sharpening derives from techniques used in film, as does so much of the terminology in Photoshop. It’s well known that a contrasty image will appear sharper than one of low contrast, so sharpening techniques look at ways to increase the contrast at edges to create an illusion of sharpness. We are not actually making the image sharper, but our eyes can be deceived into thinking that we do. Filter>Sharpen>Unsharp Mask, or similar, will take us to the Unsharp Mask dialog box. Provided the preview button is ticked we can see the effect on screen. Several options are available to us, the amount, the radius and the threshold. The amount is self explanatory and recommended starting points would be 50% for web use and 100% for an A4 print. Printers further soften images and may need a larger amount of sharpening. We are adjusting here the amount of contrast increase. The radius controls the distance from an edge that the sharpening affects, and I suggest that a good starting point is around 1 pixel for a web image, 1.5 for an A4 print and 2 for an A3 print. The threshold defines how far apart in brightness two pixels have to be before the contrast between them is enhanced. I generally use a value of 3 for my images, and a normal range of up to 10 may be a useful starting point. Quite a degree of subtlety can be employed, as a higher value here would mean that an even blue sky, with little variation in brightness in the blue, would not be sharpened. A black & white building in the foreground would be, so the sharpening becomes quite selective and avoids creating artefacts (defects) in areas of even tone. Sharpening can easily be over-done so moderation can be called for. Over sharp images show halos around edges and patchy artefacts in even areas of tone. It is true to say that we sharpen less now than when we started out in digital imaging. is always a good idea to check the submission guidelines carefully to make sure we are supplying what is required. 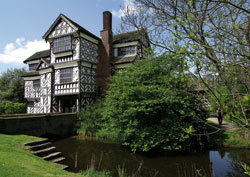 An image of Little Moreton Hall that’s unsharpened. Sharpened. Amount 100%, radius 1.5px, threshold 3. I have described a simple, but powerful sharpening method, and this is the one we use most of the time. There are other powerful techniques and as sharpening is such an important step in the process, next time I will look at some alternatives that can offer advantages of their own. The network where you can meet the news related to the politics of the whole world. Make your option more strong with cheap essay writing service and enjoy the partners in this section with the best directions to the straight pathway in better position.